The faithful HNR followers know I’ve got a serious problem with zombie novels. I’m not the only one: They’re harder to assign every single day, which is why we’ve opted to cease covering unsolicited works in the future. However, before we bring closure to this chapter of the Beat a Dead Horse book, we’ve got some loose ends to tie up. One (err… five?) 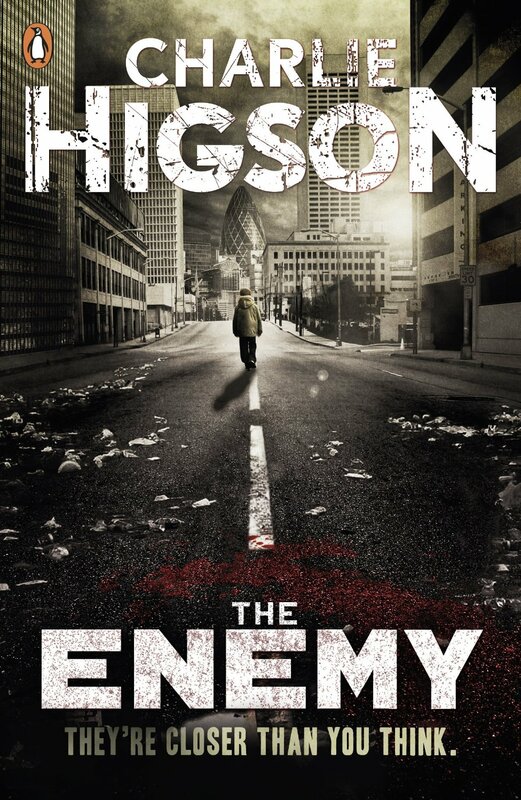 of those loose ends come in the form of Charlie Higson’s ongoing series, The Enemy. Thank the higher powers that be, Higson is one hell of an author with an ability to create highly infectious personalities. We’re talking about characters a reader can actually invest in, and begin to genuinely care about. That’s very, very important when it comes to this subgenre, as there just isn’t much to be done with zombies that hasn’t already been done a few thousand times prior, and it’s absolutely crucial to this series in particular as it’s the one element that genuinely distances it from the rest of the pack. In truth, the first book of The Enemy series isn’t exactly groundbreaking, and the majority of the conflicts that arise in the book are more than familiar (cannibalistic survivors, intelligent zombies, no one is safe rule, etc., etc.). That said, Higson injects what little “new life” can be injected by essentially merging the core concepts of The Lord of the Flies and The Walking Dead. I’m happy to note the success of that approach. I haven’t stumbled across too many zombie works that flat out pit children versus adults. Maybe because the idea of killing children in a book is considered somewhat taboo territory (and you know plenty of kids are going to die when they’re forced to face blood thirsty zombies twice their size), maybe because half of the authors putting these zombie novels together are doing so because zombies are among the simplest of concepts to tackle and there are so many novels out there that one need only copy (yep, I said it!) past works to reach the finish line; why take a risk with creativity when we can play Mirror Mirror, just to get a book out there, right? Well, Higson stumbles right into the expected pitfalls of zombie fare by leaning on plenty of tired tropes, but as noted, he’s also got a few aces up his sleeves. I love the willingness to place children on the frontlines come war time. That may sound… sadistic, but at this point, authors had better step out on a limb if they’re hoping their “new” (sorry folks, but there’s no such thing as a “new” zombie story) zombie novel will catch on. I also love the fact that Higson allows his characters to carry the story rather than placing the bulk of the weight on the shoulders of the undead, or in this case, the diseased (Higson uses the old they’re not technically zombies because they haven’t died and risen tactic… although these are clearly zombies). There are far too many writers out there who attempt to introduce us to meaningful personalities, but come away having created little more than cookie cutter crap we’re already tired of. Higson’s characters feel like actual individuals, and they respond as one would expect hardened children to respond in the midst of the apocalypse. I don’t need to get too deep into specific plot details. That base has basically been covered. London is ruins. The grownups become infected (simply because they’re grownups, so far as we know after a single book) by some strange disease that transforms them into shambling monsters and the kids are forced to fend for themselves in a world overrun by big nasties. That’s the gist of the story, although things don’t get seriously interesting until the focal band of survivors make it to Buckingham Palace, where life and order are about to take on an entirely different meaning. Again, I applaud Higson for creating a fine lineup of young personalities that readers can truly cheer for. There are quite a few youngsters in the story that really resonated with me personally, and I found the latter portions of the novel, when human tensions really, really escalate, to be extremely rewarding. Ultimately I’ll admit that it’s difficult to declare The Enemy a monumental piece of fiction, but it is rather impressive for a zombie piece. My only major concern at this point is the future of the series: How can Charlie Higson possibly keep the momentum alive through the next 2,000-plus pages of the story?